Photo 1 Overhead of the course and the beaches just a short ways away. Special Features: Association beach access, direct access to Mink Meadows Golf Club course and clubhouse, views of the 9th fairway. This contemporary home overlooking the 9th fairway of Mink Meadow’s golf course is a golfer’s paradise on the Vineyard. With bright open spaces inside, plenty of room for family and guests, and the private association beach just a walk away, its easy to imagine a quintessential summer day in this home. Photo 2 Gather around the charming fireplace, or head out to the deck for breath of fresh air. Downstairs, you enter into the large living room, where one of the house’s two wood burning fireplaces serves as the heart of the room. However, this cozy element is not to be overshadowed by the large windows and glass door, which fill the room with natural light and open onto the back deck. Photo 3 Bring the outdoors in with more windows than walls in the dining and kitchen area. Through the living room is the open concept kitchen and dining room, where a multitude of windows and the cathedral ceilings fill the space with sunshine. A second wood-burning fireplace in this room adds cozy ambiance to dinner parties and peaceful nights in alike. Photo 4 First floor bedroom opens onto the back deck, great for guests to have a private entry. Two guest bedrooms and a full bath with separate tub and shower complete the first floor and provide great separate spaces for guests. Photo 5 You’ll love waking up with a view in the breezy master suite. Upstairs, the master bedroom echoes the sunny dining room with high ceilings, and a private deck with views straight out to the fairway. A walk-in closet and master bath featuring a skylight and Jacuzzi tub complete this luxury bedroom suite. Photo 6 An extra room upstairs provides endless opportunities: guest room, studio, sitting room and beyond. An adorable second room upstairs can function as a sitting room or an extra bedroom. Perfect for kids to have their own, comfy space. Over two acres of land itself, the property of this home is lined with scenic landscaping and dotted with exterior structures. Aside from the multiple decks, and charming garden shed, the screened in gazebo in the backyard with an up-close view of the golf course is the perfect place to relax and unwind. Photo 8 Spectator sport: catch the action on the golf course from the shaded gazebo. Don’t just watch the golfers, though. Located within the Mink Meadows Golf Club, this home is perfect for golfers looking to access the course on a regular basis. Also enjoy the amenities at the clubhouse, just a short distance away. Golfing is not the only amenity afforded by Mink Meadows. Take the scenic walk down to the private association beach for the quintessential Martha’s Vineyard day of sunning and swimming. A bright, cheery home with an exceptional location. Golf Club Lane could be the perfect place for you! Special Features: Harbor views, granite pool area, outdoor living and dining areas, three stories, finished walk-out basement. This is the quintessential Edgartown Whaling Captain’s home. Originally built in 1795 by the Vineyard’s first whaling family, the Samuel Butler House has been revitalized into one of the premier luxury homes in the historic Edgartown Village. All the harbor's in view from the roof-top widow's walk. professionally landscaped gardens. The large doors that lead inside to the open space of the great room and kitchen make entertaining a breeze, indoors and out. The pool and outdoor living space are tucked away behind the historic facade. This sumptious Captain’s residence features modern amenities alongside period details that lend credibility to the historic neighborhood. Classic wide-planked flooring, custom raised paneling and custom moldings are juxtaposed with a stunning pool area, modern family room and media rooms. A stone fireplace provides warmth and ambiance to this outdoor living space. The first floor is comprised of a formal living room and formal dining room, as well as the great room--all three designed for gracious entertaining. Both the living room and dining room feature natural gas fireplaces. Casual everyday living is centered around the great room that combines a gourmet cook's kitchen, casual eating nook, wet bar with wine refrigerator and ice machine, and butler's pantry--plus a comfortable lounge with TV and fireplace. The great room has everything--lounge, kitchen and wet bar. The butler’s pantry has a prep area, second dishwasher and laundry facilities. A laundry room is also found on the lower level. The Butler’s pantry allows nearly effortless food prep and clean up. The home features five comfortable bedrooms spread throughout the three floors and lower level. Each features a sitting area and en suite full baths. The master bedroom suite has vaulted ceilings, walk in closets and a luxurious marble bathroom. French doors open onto a private mahogany deck. The master bedroom suite is bathed in warm sunlight as the day begins. The master bedroom features a private deck that looks out to the pool area below. The master bath has his and hers marble vanity, soaking tub and glass shower. The finished basement could be used as a retail store, office additional living space. and special entrance presents the opportunity for an in-home office, gallery/boutique or apartment. One of the best features of the captain's home is found on the roof. The widow’s walk was where a captain’s wife might brace against the railing, looking to see if their husband’s ship would return. It delivers on it's intention of offering sweeping views of the harbor. The widow's walk--for the best views in town! If desired, the furnishings are available to craft a truly turnkey purchase. It almost goes without saying, but the best Edgartown has to offer is right outside the front door. Welcome to the heart of the summer! July 4th has come and gone, and so has the annual Vineyard Cup sailing extravaganza (photos below), but there is still more to come--the annual Cottagers Tour (see below), Musical Mondays at Featherstone, Sharks baseball, gallery shows, Vineyard Playhouse events and so much more. People are also celebrating the re-opening of the Capawock and Strand movie theaters and the opening of new eating spots such as La Soffitta and Wolf Den Pizza. Martha's Vineyard celebrated Independence Day with a bang! Martha's Vineyard's finest leads the march through Edgartown. American spirit on wheel- one of the many classic cars featured in the parade rolls by. The crowd was transported back to 1776 with patriotic tunes & rifle fire from these patriots. No Independence Day would be complete without fireworks over the Edgartown Lighthouse. Holmes Hole sailing is back in action. The annual Vineyard Cup was held just last weekend. Five historic Oak Bluffs cottages are on display in the annual Cottagers Tour this week. Check out David Lott's preview preview article published in the most recent Vineyard Gazette which outlines the beautiful properties featured, including Ron and Charlayne Hunter-Gault's tasting of South African wines which they have been importing for more than a decade. Vineyard Open House is continuing to expand with the addition new services and new team members. Would you like us to manage your summer rental property? Kristin works with a select group of properties, offering the owners world-class service in managing and organizing their properties and the renters therein. 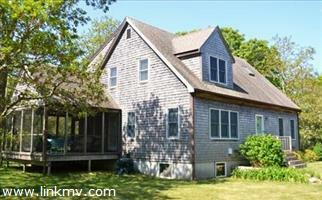 For more information, contact Kristin Zern or call Vineyard Open House Real Estate, (508)-338-2495. Rates are edging up in anticipation of the promised Fed rate increase which has yet to arrive. The real estate market continues to build up steam. The bottom line, though, is that it is still a buyer's market. While there are 200 fewer properties for sale than at this time last year, there are still 300 properties looking for buyers. Properties that have been fixed up with new kitchens and baths and priced right are going quickly, and Edgartown and its higher-end homes continues to be the sales leader both in numbers of homes sold (32 in Q2) and the selling price percentage over assessment (137%). Here's a sampling of homes for sale in three different price brackets. Please contact me if you want to know more, or want to investigate other properties. This unique and cozy Vineyard Haven cottage is surrounded by lush greenery. 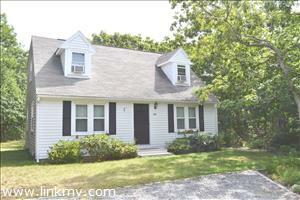 With a refreshed interior and prime location right along Sheriff's Meadow woods, a short walk from downtown Vineyard Haven, this home is an ideal vacation or year round property. Classic features, like the gas fireplace and homey window seat are mixed with modern amenities, such as the fully renovated kitchen with breakfast bar. The house is split level, with a three comfortable bedrooms and a bathroom on the lower level, and a bright and airy open living, dining and kitchen area up a half flight of stairs. Out back, you can enjoy the peace and quiet of the wooded lot on the deck, a great place to grill and entertain. Send me more information about this home! Spend the evening reclined on the wraparound porch on this Victorian home. This East Chop home is filled with unique charm from the two master suites, to the original diamond windows and wood burning fireplaces. On the first floor, an expansive living room with cathedral ceilings is a lovely, airy space to entertain, and the large eat in kitchen is sunny and bright. A ground floor master suite features a brick fireplace and built ins. Upstairs is the ultimate bonus, an additional master suite, as well as two more bedrooms with a shared full bath. Outside, you can enjoy a meal and the privacy of this location, across from the Baptist Temple town park and a short stroll to the Oak Bluffs harbor, on the spacious porch. Send me more information about this home! With six bedrooms inside & over an acre outside, space is no issue for this West Chop gem. Located on the West Chop "loop" this spacious year-round home gives you a classic Vineyard feel with modern updates. Enter and be invited into the bright living and dining rooms, where grand French doors let in the sun and summer breeze and come winter, the stately fireplace creates a cozy environment for friends and family. The country kitchen and butler's pantry add to the charming original features. Privacy is abundant in this house, beginning with the master bedroom suite and private deck sequestered in its own end of the first floor. With separate space in each of the five additional bedroom, two on the ground floor and three upstairs, there's ample room for extended family and guests. Outside, the spacious back deck and more than an acre of land are perfect for entertaining, catching some sun or taking a peek at the water in the distance. The home's location within walking distance of the (private) West Chop Club and beach (membership required) and Vineyard Haven are an added bonus and convenience. Send me more information about this West Chop home! Watch for our new Coffee Fridays at our Union Street office in Vineyard Haven from 9 am to Noon. We'll be serving Chilmark Coffee, updates and advice about the Vineyard real estate market. And if you are getting ready to sell your home, we'll be available to talk about marketing your home and the many ways we can help you sell it fast. Contact David Lott for more information. Wind and Rain and Nor'easters, Oh My! The Daniel Fisher House in Edgartown sparkles for the season. Winter and the holiday season are in full swing on Martha's Vineyard. As I write this the wind is howling outside with gusts over 50 mph. It has been raining all day and water is flooding through the streets. BUT, I am on the Vineyard. The wood stove is cranking out the heat and if I put my head outside the front door, I can hear the comforting blast, like that of an old steam engine, of the ferry as it prepares its return to Woods Hole. A walk through town will reveal store windows dripping in sparkling lights, cheery window displays and comfy come-ons to buy warm and cozy presents. You can walk into your favorite restaurant (except maybe for Offshore Ale) and get a seat, and holiday events such as the choir sing at Edgartown's Old Whaling Church bring a tear of rememberance to your eyes. what time of the year it is. It is always a pleasure. And as we head into 2015, I look forward to seeing you again on-island during those moments when you can break away from the hustle and bustle of the mainland. Main Street Vineyard Haven, a tree lights up next to the Capawock Theater. "Christmas is coming! Christmas is coming!" That’s how my grandmother, Addie Crist, would greet me when she came to visit my parents and me for the holidays. She would walk in the house and the front hallway — all five-feet-two inches of her — grab both my hands and dance around in a happy circle and repeat the phrase over and over. If any season or time of year ever came to represent a person in my life, Mimi’s, as I called her, was most definitely Christmas. What I didn’t know at that time of my youth was that Addie Crist’s special season was eventful for far more than just me and my family. She had been married to Harris Crist and lived for many years in Brooklyn, N.Y., where he was the longstanding managing editor and ultimately co-owner of the Brooklyn Daily Eagle. The Eagle was a respected daily in its day and had bureaus throughout the world, competing fiercely with all the majors papers. Harris sold the paper in the mid-thirties and retired to the Vineyard in 1936. He and Addie had a home designed and built that overlooked the harbor in Vineyard Haven. An elegant structure with five fireplaces, a stately study with a harbor view and five bedrooms, it would be their home until it was sold to the Strock family in the early 1950s. While Harris was an avid golfer and played “every day there wasn’t snow on the ground” at the Oak Bluffs Country Club (now Farm Neck), Addie immersed herself in Vineyard life. A talented musician who could play by ear, she played the organ at Grace Church. While there, she must have been struck during her favorite time of the year to realize how many children did not receive any presents at all or simply needed clothes such as a jacket or mittens. Thus, in 1938 Addie got a few friends together and knitted six Christmas stockings, filled them with toys and gave them away to needy children. It was a small beginning, but now 76 years later, the Red Stocking Fund is a major Island initiative that helps more 300 families each year, and most important to my grandmother, spreads the message of Christmas giving far and wide. I remember vividly Addie’s last Christmas at our house in 1965. Despite a weakened heart, she danced with me in circles in the front hallway and happily gave out her presents on Christmas morning. The next day, while resting in bed with the sounds of her children and grandchildren filling the air around her, she put down her book, folded her glasses on the side table and quietly passed away. She had determinedly made sure that she had spent one last Christmas with those she loved most. Merry Christmas, Mimi! Christmas is coming, Christmas is here! Mimi and me, Christmas, 1960.
represent a person in my life, Mimi’s, as I called her, was most definitely Christmas. What I didn’t know at that time of my youth was that Addie Crist’s special season, and her impact on it, was eventful for far more than just me and my family. She had been married to Harris Crist and lived for many years in Brooklyn, NY, where he was the long-standing managing editor and ultimately co-owner of the Brooklyn Daily Eagle. The Eagle was a respected daily in its day and had bureaus throughout the world, competing fiercely with all the majors papers. until it was sold to the Strock family in the early 1950s. musician who could play by ear, she played the organ at Grace Church. While there, she must have been struck during her favorite time of the year to realize how many children did not receive any presents at all or simply needed clothes such as a jacket or mittens. Red Stocking Fund is a major island initiative that impacts more 300 families each year, and most importantly to my grandmother, spreads the message of Christmas giving far and wide. I remember vividly Addie’s last Christmas at our house in 1965. Despite a weakened heart, she danced with me in circles in the front hallway and happily gave out her presents on Christmas morning. Grace Church pews fill up with Red Stocking Fund presents. the sounds of her children and grandchildren filling the air around her, she put down her book, folded her glasses on the side table and quietly passed away. She had determinedly made sure that she had spent one last Christmas with those she loved most. Merry Christmas, Mimi! Christmas is coming, Christmas is here! Tell us about your Vineyard stories and we'll print some of the best in the future. Mortgage rates dipped slightly in December, pleasing home buyers eager to get their offers in before the end of the year. TIP: Paint Your Trim. Peeling paint on the trim of a house is an eye-catcher a home seller should avoid. I have seen so many houses that look down in the mouth simply because the trim is shabby. Trim that looks in good shape with working gutters is an important part of good curb appeal. Sold! 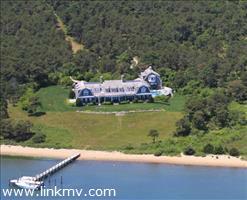 This 2.7-acre waterfront compound in Edgartown went for $15M, $4.5M less than the asking price. Thirty-three single-family homes were sold on Martha's Vineyard in November with a median price of $550,000 and a total value of $47.5M. While sales declined from October, it was still the sixth most active month of the year. For the year, 369 homes have been sold, 3% fewer than last year. Homes, on average for the year, are selling at 93% of the asking price and 110.5% of assessed value. The luxury market in Edgartown continues to lead the way with 11 sales in the month, followed by Vineyard Haven and Oak Bluffs with 10 each. West Tisbury, Chilmark and Aquinnah all had three sales. Edgartown had the top 3 most expensive homes which went for a combined $23.3M. Overall, 13 homes sold for $1M or more, 20 homes went for less than $1M. In regards to pricing, the strength of the luxury market is bringing up the average sale price, but the median price of homes sold is actually lower than last year. This tells the story of two markets, with upwards pressure on the top of the market, but downward pressure at the lower end. What we're also seeing is that homes that are well-prepared to go on the market--appliance upgrades, up-to-date-maintenance, fresh paint--are selling. Add in a good location, and they go quickly. Set on half an acre, this cape style home is located in a nice development with easy access to all island towns. Features include southern yellow pine floors on the first floor, kitchen with stainless steel appliances and center island. The kitchen is open to the dining area and a separate living area. First-floor bedroom, many updates w/large deck and a nice size backyard. Near bike paths. Send me more information about this home! Well-maintained Cape Cod-style home built in 1995 and sited on 1.5 private acres. This move -in ready home has an ensuite master on the second floor and features central a/c, central vac, garden shed, mahogany decks, screened porch, gourmet kitchen with cherry cabinets and walk-in pantry. Property abuts conservation and owners have the option of joining the adjacent Stoney Hill Association to enjoy the amenities of tennis, pool and basketball. Send me more information about this home! Located in the heart of Katama and reduced $450,000 from its original selling price, this custom home was built in 2007 and offers 4-bedrooms each with a private bath. A cathedral ceiling enhances the family room with a wood-burning fireplace and access to a well appointed screened porch. Gourmet kitchen, hardwood & radiant heated floors, state of the art sound, 2nd floor bonus room, den and a two-car garage. 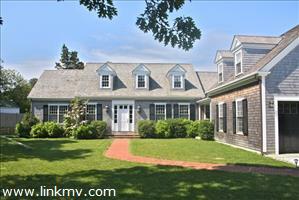 Ideally located just off the bike path and only minutes to the village of Edgartown. Send me more information about this home! Looking out to Martha's Vineyard from the ferry coming out of Wood's Hole. That water looks cold! 'On Martha's Vineyard' is published by Vineyard Open House Real Estate. Copyright 2014-15. It's a beautiful summer day on Martha's Vineyard, and summer visitors and renters are contiuning to leave the island behind. But while the view is of the great fall exodus, vacationers are already signing up for their rental property for summer 2014. We can see the ferry from our office in Vineyard Haven, so we walked down to the dock this morning to document this sad ritual of departure. But the sting of leaving can be assuaged somewhat by being assured that one's vacation is already set for the following summer. The fall is a busy time for reserving time for the next summer. Call us at 203-270-9357 (cell) or 508-338-2495 (office), or email and we'll find you that perfect spot for your next vacation! The harbor is still full of boats for fall sailing. Live your dream of the active life! Imagine walking out the back door of your Martha's Vineyard home onto conservation land where you can jog, bike or walk on trails that go for miles. You can experinece this dream of the active life everyday with this custom designed home set on a private wooded acre in Oak Bluffs where it abuts Meadow View Farms conservation land. Head in the other direction and you are only a short bike ride from the center of Oak Bluffs. A 3-story contemporary design, this expansive home features a bright living room with cathedral ceilings, gas fireplace and 12' sliders accessing a sunny deck where a scenic panorama of the woodlands is on display. Entertain in the separate dining room adjoining a state-of-the-art kitchen. The house features two master bedrooms that have been remodeled with a first-floor master suite featuring walk-in closet, tiled shower and whirlpool bath. The laundry is conveniently located on the first floor. Besides four large bedrooms, there is a loft room on the third floor for guests or children. The basement is full with bulkhead, providing ample storage opportunities. Solid rental history. This modern contemporary Cape located in the private development of Hidden Cove has a new price which has dropped it $124,000 below its original asking price. Now being offered for $525,000, its listing price is actually $56,000 below the assessed value. Included in the price is the use of the Hidden Cove Association's private tennis courts, private dock and mooring access. The value contained in this property gets better. The lot is well over a third of an acre at .39 acres. There are 3 bedrooms, two baths and an open kitchen and dining area. Three sliders in the dining area open to a large, newer mahogany deck and brick patio. There's a first-floor bedroom and full bath, and an open living room with wood-burning fireplace. The second floor has two more good-sized bedrooms each with sliding glass doors out their own pricate mahogany deck. Also on the second level is a full bath and washer/dryer. Full basement and garage offers lots of storage space. At $525,000, this home is an excellent value and shouldn't last long. Farm Neck Golf Club: Enjoyed by presidents, celebrities & vacationers. With a postcard beauty but plenty of shotmaking challenge, this mature and lushly maintained course stirs the golfing soul with views of Sengekontacket Pond and wide island beaches. It has a complete pro shop, upscale rental equipment and a driving range. Overlooking the first tee, the Farm Neck Café offers casual dining from April through November. In addition, the Café is available for private parties, receptions and weddings either indoors or under the Farm Neck Tent. Farm Neck Estates is a neighborhood of wonderfully situated residences in the historic Martha's Vineyard town of Oak Bluffs. The group of homes borders a beloved Vineyard golf course favored by presidents Bill Clinton and Barak Obama, celebrities and traveling golfers of all skill levels. Island Beauty, Ocean Views: The Farm Neck club community—the golf course and adjoining cluster of homes—rests on a peninsula of rolling farmland on the eastern side of the Island, overlooking Nantucket Sound. With summer just ahead, inquire now about summer rentals! Ask Karen Overtoom about summer rentals! Click here for more information about Farm Neck!